Although his name is in the title, there's another character besides Han Solo that fans are equally, if not more excited to see on screen in Solo: A Star Wars Story. 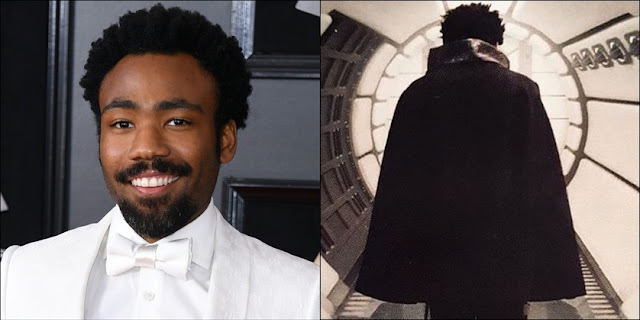 Lando Calrissian, whom we haven't seen in the flesh since 1983's Return Of The Jedi, is returning to the big screen courtesy of Donald Glover, who is portraying a younger version of the character originated by Billy Dee Williams. Donald Glover will star alongside Alden Ehrenreich (Hail Caesar!) as Han Solo, Joonas Suotamo(The Last Jedi) as Chewbacca, Emilia Clarke (Game of Thrones) as Qi'Ra, Woody Harrelson (True Detective) as Beckett, Phoebe Waller-Bridge (Fleabag) as L3-37, Thandie Newton (Westworld) as Val, and Paul Bettany (The Avengers) as Dryden Vos. The film is directed by Ron Howard (A Beautiful Mind), with a script by Lawrence Kasdan (The Empire Strikes Back) and his son Jon Kasdan (The First Time). Solo: A Star Wars Story hits theaters on May 25th!